I have an LG Viewty Smile mobile which came with an USB cable for connecting it to PC which has Windows 7, but I am not able to do that because whenever I insert this cable, the computer first of all shows "USB Device not recognized". I have tried it with all of port present in my computer but i always see the same message. Is there any way to solve this issue? Re: PC not recognizing the USB device of mobile. Are you getting a “USB device not recognized” error whenever you plug in a USB mouse, keyboard, or other USB device? I love USB and have 5 ports on my computer so that I can connect my mouse, keyboard, camera, phone, and printer to it all at once! 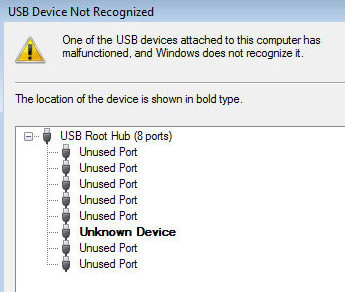 You may also see in Device Manager that the device shows up as an “Unknown Device”. Simply UNPLUG YOUR COMPUTER FROM THE POWER SUPPLY. Yes that’s it! Note that this does not mean just turning off your computer because modern computers don’t really turn off when you press the power button as the motherboard still gets power. There are several reasons behind this problem like other USB hardware which may reducing the timing, attached hubs & devices, not support to USB 2.0, host controller hardware & older version of USB driver. Type Devmgmt.msc & press enter. Expand "Universal serial bus controller" settings. Right click on each of "USB root hub" & select Properties. Select the Power management tab & check the box beside "Allow the computer to turn off this device to save power" option & click OK. Right click on the computer & click on the "Scan for hardware changes" option under Action menu. You may also fix this issue with the help of a .exe file. Download & RUN the file. Copy paste the following link in your browser to download it. Hope this will help you to solve the USB issue. As all the ports in your computer is issueing the same message and failing to recognize the mobile fone, be sure the problem is not in the PC. The problem should be in the cable that attach mobile with the PC change it to see the performance. Click System and Maintenance, click System, then Device Manager. If Control Panel is in Classic View, double-click System, then Device Manager. If prompted for "administrator password" or "confirmation", type the password, or click Allow. In Device Manager, double click to expand "Universal Serial Bus controllers", right click on the "Host Controller", click "Uninstall" then "OK". Check if there is an "exclamation mark along the driver", it suggests problem with the driver installed. Uninstall all items under "Universal Serial Bus controllers". Restart your computer and Windows 7 will reinstall all USB controllers automatically. If you still face the same issue then you must download the updated USB device drivers using windows update and install them. Firstly, you need to install a PC Suite for your mobile. The PC Suite software might have come with your mobile phone. Then connect the phone and on the phone, select the option as PCSUITE. 2)now remove the your usb and reboot your system and now try to insert the your usb again now it asks to install usb software and install it from now your problem is resolved. 1.Firstly check that the USB cable is fine. 2.Also check the USB port of your computer. If there is no problem in then do as i say below. Even if there is a problem then. 2.there you click on 'manage'. 3.Then you go to the 'Device manager'. 4.There you make a click on '+' near the 'Universal Serial Bus Controller'. 5.There you make a double click on any one of the 'USB Root Hub'. 6.There you select 'Use this device (Enable). 7.At last click 'Apply' and then 'OK'.